Delivers maximum cleaning performance and reliability. Easily make hose connections without having to kneel on the ground. Take your pressure washer anywhere around your home, regardless of the terrain. Rated 3 out of 5 by skip from Just received the washer and used it once. Seems OK. Started without issues. I'm not sure about the pressure/ cleaning ability. I had a 3100 psi, 2.4 before this one and it had a good deal more pressure (cleaned better and faster). Although there is a gas shut off on this model, draining the tank will be very difficult. My last unit had the gas line very accessible so it was easy to drain the tank if you had not used all the gas. If it's going to be a month or so before you use it again, the tank should be drained. On this one that's going to be tough. I'll have to see how the unit holds up. It’s made in the USA, lets hope that helps. Rated 5 out of 5 by Psheck from SO FAR SO GOOD The power washer has done everything as advertised to this point. Still pretty new so I hope it stays doing great! Rated 4 out of 5 by Crystal from Easy to use I don't have a lot of experience with pressure washers, but this one seems to work great for what we wanted it for. Easy to put together. Sturdy construction. We have used it once on our driveway and it worked great. Rated 1 out of 5 by CarNut from Damaged after 6 uses I used this unit a total of 6 times, for jobs all under 20 min of use. Went to use this weekend (6th time) began spraying and lost pressure. As I was walking back to the pressure washer to turn the unit off and inspect, the pump exploded shooting bearings all over, cracking the housing and shattering all the valves and springs. The unit is comparable to other brands on the market for the features however at a much higher price-point. In my experience with this unit the quality was very poor. Rated 4 out of 5 by gewing57 from Good product Good product but the engine runs rough and jack rabbits. Rated 5 out of 5 by Fausto906 from Easy to use Features and ease of use makes this a great pressure washer to buy. Rated 5 out of 5 by GerrySham from Exactly what I wanted After many comparisons I selected this one. It does a magnificant job, is very versatile and has a wonderful hand control with ability to easily change output. Great value and fully satisfied. I have no hesitation in recommending it. 3100PSI Residential 6923 is rated 4.7 out of 5 by 121. Love Generac products? 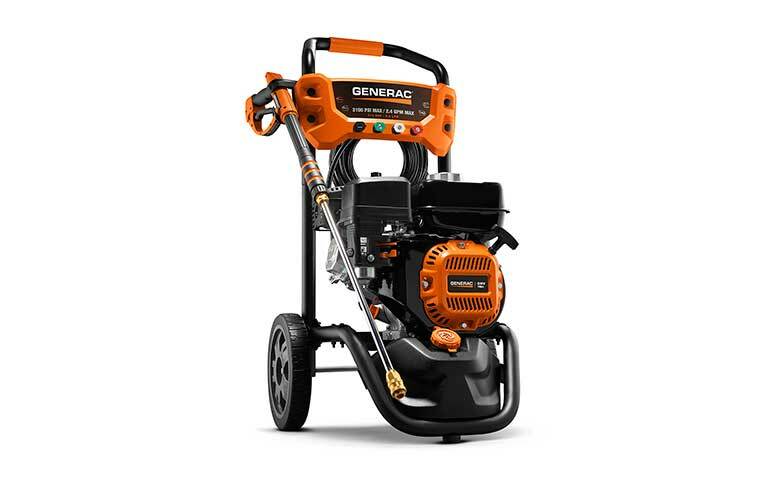 Take your fandom to the next level by joining the Generac Nation. Get special offers and exclusive information about all things Generac.